Through a comprehensive curriculum at Massage Institute Of Cape Cod, our mission is to thoroughly prepare students in the art of therapeutic massage. Our fine program and professional staff combine to awaken in students an awareness which we call Hands Of Healing Intention. Massage makes a person more accepting, relaxed, nonjudgmental, in tune with others, understanding of and sensitive to the body and its health. Which in turn helps the massage therapists not only to heal their clients, but to heal themselves as well. We provide an inexpensive, convenient and flexible way to receive the training necessary to become a licensed professional massage therapist. To enable graduates to work in the massage field and to start their own massage business. As well as prepare students to become Nationally Certified Massage Therapists. We offer Continuing Education Seminars for our graduates and other professionals that need C.E.U.'S. You will find upcoming courses listed in Continuing Education. Certification and Licensing in Massachusetts is regulated by the State. 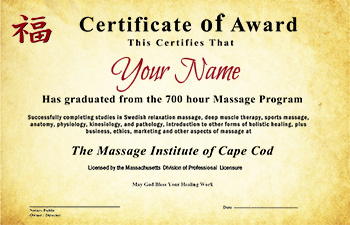 Students of Massage Institute of Cape Cod will be awarded a Certificate of Completion by the school upon the completion of the 700 hours required. Students will submit an application to the state at a fee of $225.00. Graduating students seeking to obtain a license for a business must also apply to the State, which requires graduation from a 650-hour program in a state-approved massage school. Massage Institute of Cape Cod 700-hour hands-on and academic training prepares professional massage therapists to pass the Massage and Bodywork Licensing Exam(MBLEX)) exam, which is the national standard to prove competence to a licensing board.